Elizabeth was born to the King of Hungary in 1207. When she grew up, she was politically matched to a Prince, whom she loved, and had three children with him. Although she was living as royalty, Elizabeth’s true passion was caring for the poor. She did this each day but, after a while, her husband began to pressure her to stop. So, she became creative and started leaving the castle to meet the poor with food and staples hidden in her frock. Becoming suspicious, one day her husband followed her and questioned what was in her frock. Elizabeth turned to him and, just before she opened her frock, the food and staples turned into beautiful, red roses. Seeing the roses, her husband was satisfied never questioned her again. Today, you will notice that most pictures of Elizabeth portray her with food and red roses. In her short lifetime, she had a hospital built for the poor and became known for having fed 900 starving people daily during a great famine. Tragedy struck when her husband was killed in a crusade followed by a political struggle which drove her from the castle. 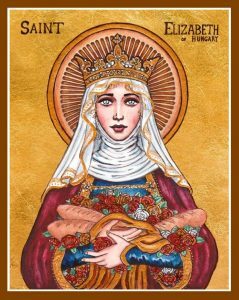 Elizabeth then lived and worked with the poor and died in 1231 at the age of 24. In 1235, Pope Gregory IX canonized her as a saint. This means that the Church believes the example of Elizabeth’s life is a model we can learn from. It is with great pride that we have our hospital, CHRISTUS Southeast Texas St. Elizabeth, named after her. We are honored to remember the example of her life on her official memorial day, November 17th.